To protect those in the front line and the public at large, Smiths Detection provides government regulated technology products and advanced services, to security experts and governments worldwide. We detect and identify CBRNE material and other dangerous or illegal objects. Contact information for individual markets is shown at the end of this entry. Smiths Detection products and systems help to eliminate threats at airports and on board aircraft and maintain public confidence in air travel. Our security solutions have been adopted at airports across the world, as well as applications in other mass-transit terminals. 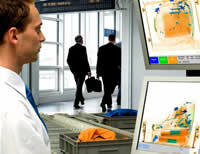 The combination of x-ray screening, trace detection and millimetre-wave scanning is unrivalled, resulting in systems to detect explosives in checked baggage, while identifying explosives, weapons and illegal items in hand-baggage or on passengers or staff. For government buildings, power generators and public buildings, Smiths Detection has developed the most comprehensive security solution available. High technology systems enhance access control checkpoints, for people, vehicles or deliveries, through to screening prison visitors. Response and HAZMAT teams, law enforcement, and federal and local government agencies around the world trust Smiths Detection's emergency response equipment. We provide them with laboratory-grade technology in easy-to-use equipment that requires minimal training - supported by the highest service levels. Portable, hand-held equipment allows the professionals to identify unknown chemicals or to detect narcotics or chemical and biological agent threats. Smiths Detection's powerful systems have set the industry standard in cargo inspection, to reduce international shipments of contraband and discover explosives, weapons, even material for weapons of mass destruction. We meet the challenge of rapid detection without disrupting the daily flow of goods. A total solution for cargo inspection from single parcels to fully loaded sea freight containers. Over a period of more than 50 years, Smiths Detection has developed a partnership with the military that has resulted in a range of products to protect armed forces from attack by chemical or biological agents. Protection from today's threats requires the highest manufacturing standards possible, easy-to-use equipment in life-and-death situations, and the capacity to minimise false detection alarms. Smiths Detection products provide the highest level of confidence in battlefield and security situations.